Our human development work is fundamentally about habit change. To become a better leader, you need to toss off bad habits and replace them with better habits that build goodwill, trust and collaboration. As a follower, you must also adopt more constructive behavior patterns that accept personal responsibility, build better peer and boss relationships and improve mutual support, collaboration and innovation. As a team, collectively you need to build a better internal culture that values these positive habit patterns and reinforces that productive behavior. Our achievements are the sum of our habits. What we get done each day is built on the habitual way we approach our job and work relationships. 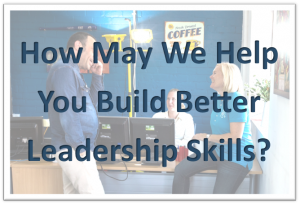 We know from three decades of experience in developing leaders that holding onto bad habits, largely out of comfort, impedes your own career progress! Warren Buffett (who else?) noted this about habits, especially the bad ones you need to break. All habits are hard to break. It takes commitment, self-control, a willingness to accept outside input without defensiveness. Self-control is like a muscle—to build it up you need to exercise it. People assess your intent by observing your behavior. They cannot get inside your head. They listen to what you say and monitor your tone of voice, your visible emotions and your body language. If you are not aware of how your behavior reflects (or likely doesn’t) your intentions, you cannot figure out which of your behavioral habits are impeding rather than abetting your progress. Distracted conversations – With your phone a constant attendant, always close at hand, the distractions that you allow into your space multiply. How good are you at tuning out these distractions and focusing on the person with whom you are speaking? Are you all there for that person? Do you turn off your phone, or at least all its alerts, during a business conversation? Do you ask that everyone involved does the same to signal how important THAT conversation is? Arguments by e-mail or text – Do you take the time to meet in person or by phone with a person with whom you have a disagreement or an issue? Or do you fight it out hiding behind electronic communication? E-mail exchanges have a value, especially if you need a few moments to craft a better-thought-out reply to a question. But too often the exchange becomes rapid-fire, with deep thought left behind. Have you examined exactly how you use e-mail and text? How often have you made the effort to meet with people in person to have a frank conversation? Even a phone conversation would improve the chances of agreement. Late-night e-mail blasting – Sleep plays a critical role in lifting your mood and energy level. Sleep quality is hard to achieve if you are bathing yourself in the blue light of your laptop or phone late into the night. Your body (and your staff) need a break from connectivity. Your staff would also appreciate it if you reset your expectations of immediate responses. Your team culture should set the expectation that communications that are not urgent can wait overnight. And be sparing with the definition of “urgent!” Write thoughts and questions down in your phone’s notes app (or on paper) and close the phone. Subordinates are programmed to please. It makes them nervous to have multiple e-mails arriving overnight, so they stay up to respond. Next thing you know, a midnight conversation starts, which deprives both parties of the restorative power of real sleep. Holding Grudges – In all work environments, there are going to be fractious moments where people disagree, and the outcome may not always be to your liking. How long to you hold onto that disappointment? How personal do you make it? Can you disconnect the person from the issue? There are always going to be people whose behavior gets under your skin. Can you willfully push those memories aside? Do you take the time to get to know the person, and try to understand their internal motivations that may be driving their behavior if you consistently disagree? Multitasking during meetings – As with one-on-one conversations, give everyone in a meeting your full attention. If you find a meeting boring and unengaging, rather than tuning out, explore why. Is this meeting necessary? Is your attendance necessary? If yes, then you need to focus completely on it to make it worth everyone’s time. Also, not paying attention sends a strong signal to the other attendees that you and your needs matter more than theirs. Never multitask during meetings. These are just five of many habits that get in the way of your own productivity and professional development. Start monitoring your own behavior patterns and talk to co-workers frankly about how your behaviors are perceived. Then choose one or two negative behaviors at a time to convert into more productive habits. And get help. If you have any questions, the best step is to contact Brooke or Dave for advice. Investing in People Assets has Huge ROI Favoritism is Corrosive to Workplace Morale – Change that Lazy Habit!